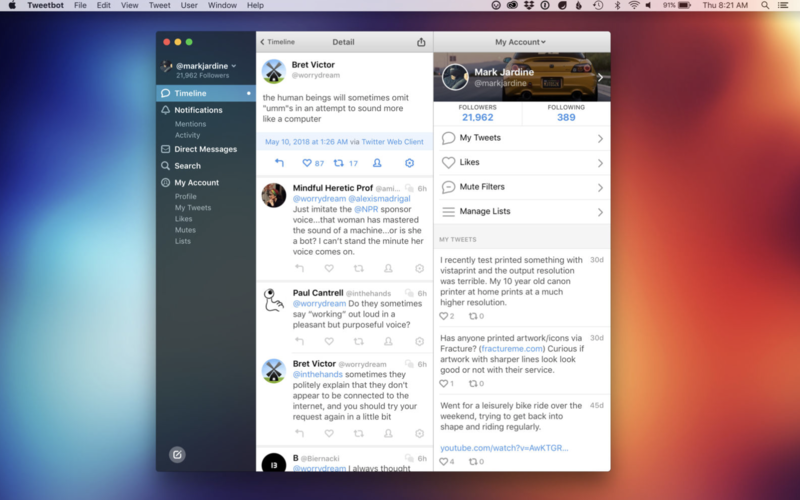 One of the more popular desktop clients for Twitter, Tweetbot, is today launching a completely rewritten version of its software, Tweetbot 3 for Mac. The updated app introduces new features like timeline filters, a new notifications view, an upgraded navigation sidebar, and more. At the same time, the company is also detailing what impact to its app could occur with regard to the API changes Twitter announced. Twitter’s API changes around data streams have been impacting third-party developers. They recently led to the upcoming shutdown of Favstar, for example, while other Twitter app makers, Tweetbot included, co-signed a letter to Twitter asking for help resolving the issues those changes would introduce to their apps. Apparently, the pushback has been working. The API deprecations scheduled for June 19, 2018 have been delayed indefinitely, Tweetbot creator Paul Haddad tells TechCrunch. When and if those deprecations occur, he adds, Tweetbot will continue to work, he says, but a few features may be slower or removed. This should give some comfort to heavy Tweetbot users who prefer this app over official clients, especially given Twitter’s ending of support for its Mac desktop client, announced earlier this year, with the intention of pushing desktop users to the web. However, a lot is still up in the air. Twitter hasn’t provided Tweetbot with details or pricing for the Enterprise Account Activity API – which is the replacement API Tweetbot would want to switch to when and if the older API is deprecated. In addition, Tweetbot 3 is introducing a series of changes to its experience as part of the upgrade. Users can now set media to autoplay or disable this, filter their timeline, and take advantage of a new Notifications view that now merges Mentions and Quotes along with other account activity, like Follows and Retweets. Columns are also now easier to manage, there’s a dark theme, and the sidebar had been upgraded so you can go to any list or DM conversation with a click. Tweetbot 3 is a $9.99 paid upgrade from Tweetbot 1 and 2, which initially debuted back in 2012, then offered users a free upgrade to Tweetbot 2 in 2015. (New users paid $12.99). The new Tweetbot is here on the Mac App Store.